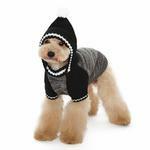 Dogs can't wait to strut their designer flair in the Contrast Hoodie Dog Sweater by Dogo in Black! 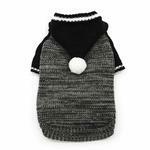 Make a sophisticated fashion statement this fall and winter with this Contrast Hoodie Dog Sweater by DOGO. This textured sweater will make for a cozier cool season with a soft wool and acrylic blend. We love the heathered gray knit paired with the black sleeves and hood with white stripe trim. The color combination is elegant and works well for both genders. The heathered gray will resist looking dirty, but the sweater can be hand washed if needed. 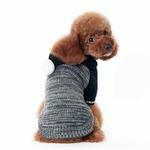 The high cut tummy and leash access hole make this dog sweater hoodie a great choice for walks on chilly days. It's also a cozy choice for hunkering down by the fire with a good book. This mix knit sweater pullover features contrasting solid black sleeves and hood and is accented with a white pompom and stripe trim. Garment care and information: Made of 60% wool 40% acrylic. Hand wash in cool water with a gentle detergent. Lay flat to dry. Contrast Hoodie Dog Sweater by Dogo - Black Customer Photos - Send us your photo! Love the sweater and so does my boy! A bit loose but he'll definitely grow into it.He is about 9 months old. Posted On 01/03/17 by Brenda L from Oakley, CA Yes, Brenda L recommends this product! Posted On 10/06/16 by Yuni from , NY Yes, Yuni recommends this product! Its cozy and roomy! Love the quality. Posted On 09/14/16 by Christina T from new york, NY Yes, Christina T recommends this product! Posted On 08/24/16 by lynne s from East Moriches, NY Yes, lynne s recommends this product! Posted On 12/18/15 by Marilyn M from Michigan City, IN Yes, Marilyn M recommends this product! I love this sweater! It is a perfect weight..Not heavy nor light..He wears medium and medium fits perfect..The quality is great and just as adorable as the picture shows..Don't be afraid to order this sweater. You will love it too..
Posted On 11/13/15 by CAROL B from BLACKLICK, OH Yes, CAROL B recommends this product! Posted On 10/26/15 by Mary A from Omaha, NE Yes, Mary A recommends this product! Loved this sweater!! Ran skittle small! But quality is great! Posted On 09/25/15 by Angie N from Alamogordo, NM Yes, Angie N recommends this product! Absolutely love this sweater. Fits perfectly. Very glad I bought this sweater for my little girl.